This article is about the Republic Airways that is currently operating. For the Republic Airlines that was founded in 1979, and purchased by Northwest Airlines, see Republic Airlines (1979–1986). Republic Airways Holdings incorporated a new subsidiary, "Republic Airline, Inc." (sic), in 1999, but the subsidiary had no activity prior to 2004 and no ability to operate aircraft prior to 2005. In 2004 the holding company activated Republic Airline in reaction to a pilots' suit against American Airlines. American had awarded the flying of 44-seat regional jets to Chautauqua Airlines, then the main operating subsidiary of Republic Airways Holdings. However, Chautauqua later started to operate 70-seat regional jets on behalf of United Airlines, and this caused American to be in violation of its pilot union scope clause, which prevented another airline from operating on behalf of American if that airline was operating jet aircraft of more than 50 seats, even if such aircraft were operating on behalf of a carrier other than American. To repair the situation, Republic Airways Holdings activated Republic Airline, and upon Part 121 certification in 2005 allowing Republic Airline to operate commercial service. Republic Airways Holdings then transferred the offending 70-seat regional jets from Chautauqua to Republic Airline. American was thereby no longer in violation of its pilot union scope clause. Republic Airways Holdings paid US$6.6 million to the pilot union of American Airlines to settle this issue. US Airways' pilots had a scope clause prohibiting the airline from operating large regional jets such as the Embraer 170. The airline negotiated around this clause by offering flight deck jobs to laid-off US Airways pilots, in a program known as "Jets for Jobs". This agreement created a subsidiary, MidAtlantic Airways. As part of US Airways' bankruptcy restructuring, the 25 Embraer 170s delivered to MidAtlantic were bought by Republic to help US Airways to come out of bankruptcy; Republic operates them along with additional newly delivered aircraft on order under a conventional Express carrier contract. In 2007, Frontier Airlines signed an 11-year service agreement with Republic Airline. Under the agreement, Republic would operate 17 Embraer 170 aircraft for the Frontier Airlines operations. The first aircraft was placed into service in March 2007, and the last aircraft was expected to be placed into service by December 2008. On April 23, 2008, Republic Airways Holdings (parent of Republic Airline) terminated its service agreement with Frontier Airlines, which entered Chapter 11 bankruptcy in early April 2008. Subsequently, Republic Air Holdings purchased Frontier Airlines in bankruptcy. Frontier branded Republic Airline E-190 aircraft provided regional capacity support. In September 2013, Republic Airways Holdings sold Frontier Airlines. As part of the sale, Republic Airline terminated the Frontier branded E-190 flying. 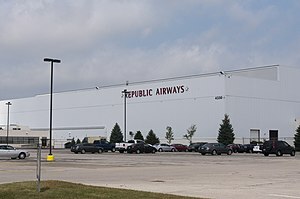 On February 1, 2008, Republic Airline opened a base at Port Columbus International Airport in Columbus Ohio. In January 2013, Republic Airways Holdings reached a capacity purchase agreement with American Airlines to operate Embraer E175 airplanes under the American Eagle brand beginning in mid-2013. Republic began service as an American Eagle affiliate on August 1, 2013, from Chicago to New Orleans, Pittsburgh, and Albuquerque. On February 25, 2016, the airline filed for Chapter 11 bankruptcy protection. The airline was hit hard because of pilot shortages, but a new contract ratified in October 2015 helped restructure the airline. At the time of filing, Republic Holdings claimed $2.97 billion in liability and $3.56 billion in assets. On November 16, 2016, Republic Airways Holdings filed their Plan of Reorganization with intentions to emerge from Chapter 11 during the first quarter of 2017. It was announced that parent company Republic Airways Holdings will merge subsidiaries Shuttle America and Republic Airline into one company, with Republic Airline being chosen as the surviving company. On January 31st, 2017, Shuttle America merged with Republic Airline. As of January 31st, 2017, Republic Airline has the largest fleet of Embraer 170 and Embraer 175 aircraft in the world. On April 9, 2017, a passenger named David Dao was forced off of a Republic Airline-operated United Express flight in Chicago which was to be bound for Louisville. He was forced off the flight by Department of Aviation officers after refusing to give up his seat for an airline employee. He ran back onto the aircraft in an attempt but was forcibly removed. A video posted on social media showing him being injured and dragged off the plane led to a public outcry against United Airlines. A Republic Airline Embraer 175 operating for American Eagle landing at Newark Liberty International Airport in New Jersey. The Embraer 175 made its United States domestic debut when the first aircraft was delivered to Republic Airline in March 2007. Total orders were for 36 aircraft, which were operated in an 80-seat configuration under the US Airways Express brand name. In July 2010, Republic ordered a further 24 Embraer 190 aircraft. In May 2012, Republic Airline agreed to fly the 28 Bombardier Q400s for United Express that bankrupt Pinnacle Airlines planned to return to its lessors. The Q400 fleet was retired in 2017. Republic Airways Holdings signed a three-year contract in October 2012 with Caesars Entertainment Corporation where its Republic Airline subsidiary would operate five Embraer E190 aircraft to provide more than 1,500 charter flights annually for Caesars. Service began in January 2013. This contract ended in August 2015 and all E190 aircraft were sold or returned to the lease holders. In January 2013, Republic Airways Holdings reached a capacity purchase agreement with American Airlines to operate 47 Embraer E175 airplanes under the American Eagle brand beginning in mid-2013. The regional jets would be deployed out of American's Chicago hub. In addition, Republic would have options to purchase an additional 47 Embraer aircraft beginning in 2015. Republic took first delivery of the E175 jets in July 2013 and service began August 1, 2013, from Chicago to New Orleans, Pittsburgh and Albuquerque. Republic began using Miami as an American Eagle hub in October 2014 and in New York-JFK in May 2015. In late 2015, it was announced Republic Airline achieved approval from the FAA for Extended Overwater Operations (EOW), which allows Republic to operate up to 162 nautical miles from shore. As of January 31st, 2017, only Republic 175 aircraft operating for American Airlines are equipped to operate as an EOW aircraft. American Airlines uses Republic to operate aircraft out of Miami International Airport to various Caribbean and Central American destinations, including the Bahamas, Mexico, Panama, Belize, Honduras, Costa Rica, Turks & Caicos, Cuba, Guadeloupe, and the French West Indies. In late 2016 it was announced, due to the impending merger with Shuttle America, that the 80-seat Embraer 175's operated for American Eagle (previously US Airways Express) would have the last row of seats removed (4 in total) to conform with Delta's scope clause, which limits all regional jets to a maximum of 76 seats. These aircraft will eventually be retrofitted to American's standard Embraer 175 layout. On January 31st, 2017, all existing aircraft operating under the Shuttle America operating certificate were transferred to the Republic Airline Inc. operating certificate, thus ceasing operations for Shuttle America, and completing the merger process of both subsidiaries. United Express Flight 3411 incident - flight was operated by Republic Airline. ^ "FAA JO7340.2D" (PDF). faa.gov. ^ "Republic Airlines on ch-aviation". ch-aviation. ^ "Republic Airways Holdings Form 10-K for Year Ended December 31, 2004". Retrieved August 16, 2013. ^ "Exhibit99.1 Republic Airline Certification". Retrieved August 16, 2013. ^ "Republic Airways Continues Attack On Pilots Group With Sham Furloughs". September 8, 2011. Retrieved August 16, 2013. ^ "Republic Airways to acquire Midwest Airlines". The Business Journal. June 23, 2009. Retrieved August 1, 2013. ^ a b "Republic Airways to operate large regional jets for American Airlines". dallasnews.com. January 24, 2013. Retrieved February 15, 2013. ^ a b "American Airlines Unveils Embraer 175 Regional Jet Design". forbes.com. July 31, 2013. Retrieved August 1, 2013. ^ News, ABC. "Business Index". Retrieved October 30, 2016. ^ Gara, Antoine. "Republic Airways CEO Says Bankruptcy Filing Will Take Airline To New Heights". Retrieved October 30, 2016. ^ "Republic Airways Files Plan of Reorganization, Intends to Emerge from Chapter 11 in Q1-2017". businesswire.com. ^ "Republic Airlines Fleet Details and History". www.planespotters.net. Retrieved July 7, 2018. ^ "FARNBOROUGH: Republic signs for 24 more Embraer 190s". July 21, 2010. Retrieved July 21, 2010. ^ "Republic Agrees To Take Over Q400 Flying for Pinnacle". May 15, 2012. Retrieved February 15, 2013. ^ "Republic Airways, Caesars Entertainment Sign Three-Year Flight Agreement". businesswire.com. October 25, 2012. Retrieved February 15, 2013. ^ "Republic Airlines To Start Flying E-175 Out Of Miami For American Airlines October 2". Airchive. ^ "Republic Airways, Embraer sign firm order of 100 aircraft". businesswire.com. December 20, 2018. Retrieved February 25, 2019. Wikimedia Commons has media related to Republic Airline.